Veteran’s Day (the 11th of November) is almost upon us. Now is a good time to reflect on those who have given so much in the service of their country and, by extension, us. Perhaps your mobile home park already caters exclusively to veterans or has a sizable number of veteran occupants. Or maybe they are a demographic you want your park to appeal to. Either way, it’s a good time to think of how you can improve your park to be more accommodating to veterans. There’s no denying the fact that many of our veterans are struggling as a direct result of their service to our country. Many face financial, physical, and emotional challenges. Though the situation of veterans has improved a great deal over the last ten years, there is still a lot that can be done. And there’s no better place to start than on a local level with your own community. Why mobile homes for our veterans? They provide a quieter style of living by being outside the busy city centers. Mobile homes and parks are much more affordable than real estate. Because mobile homes are separate units, they provide more privacy than apartments. Mobile homes are easy and relatively affordable to alter – for instance, to make them wheelchair accessible. Most veterans face a number of challenges as they settle into civilian life. There are plenty of avenues through which they can apply for specific benefits to aid them with specific problems. In many cases, veterans aren’t even aware of all or most of the benefits that they may qualify for. As a park manager, you could be a great asset to your veteran residents simply by being able to point them in the direction where they need to go. You could even go a step further and help them apply. One of the most obvious benefits is veteran home financing. Known as VA loans, these loans are backed by the Department of Veteran Affairs. This means that the VA will continue to repay the loan if the loanee can’t afford their payments any longer. This assurance makes it possible for lenders to provide much better interest rates and mortgage terms, such as zero-down payments. Additionally, you, as the park manager, will have more assurance that the tenant can afford their home and will stay there long-term. Another important housing benefit that veterans can apply for is an Adapted Housing Grant. This comes in two forms: A Special Housing Adaptation (SHA) grant which will give the applicant the means to make accessibility improvements to their home if they have disabilities. Or a Specially Adapted Housing (SAH) grant which will help them pay extra for a home with disability features. 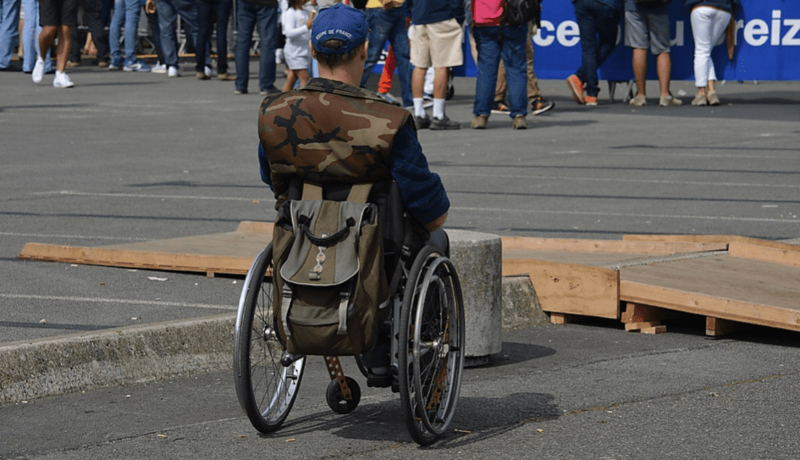 If you have specially-adapted housing in your community, the latter could help veterans purchase a home in your community while the former will help them modify the home to suit their needs in case of disability. Until they do some digging, many people aren’t even aware of how many veterans and organizations are available within their own community. There are almost just as many local groups and organizations as there are large, nation-wide ones. 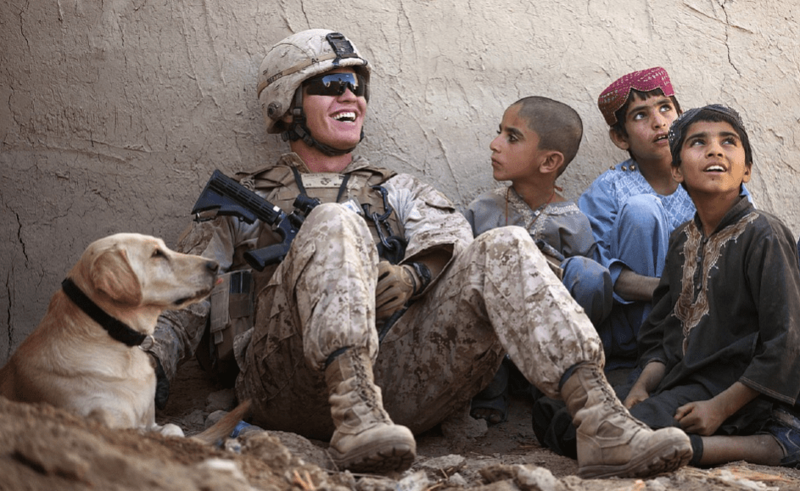 Getting to know your local veteran community will open up a whole new world of possibilities, not just for you but for your residents as well. A good starting point is to contact some of the larger veteran’s organizations such as Hope for the Warriors, Irag and Afghanistan Veterans of America, Navy-Marine Corps Relief Society, and many others. They may have local wings or centers close to your park and will be able to put you in contact with other reputable local groups. By getting in contact with local organizations and projects aimed at veterans, you can get to know the community better. You’ll also have avenues to connect with possible future tenants. Best of all, you’ll gain a deeper understanding of the type of veterans within your community and their needs. Some of the founders and most active contributors to these organizations are veterans themselves. If your community has a lot of veteran residents, there’s a good chance that there’s a local organization to help them with their own issues. And one they may wish to volunteer for themselves. Helping other veterans in need of assistance is a very therapeutic process for veterans and is something close to their heart. The unfortunate truth is that most veterans paid a high price for their country at some point. Chronic physical injuries that have a tangible impact on the lives of those who have suffered them are very common among veterans. Without accessibility features in their homes, it can not only be a constant reminder of their hardships but can also negatively affect their quality of life. In fact, it’s very common for injuries, especially chronic back pain, to lead to depression. Most injuries affect the mobility of veterans which makes it harder to go about their daily routines. However, mobility injuries are some of the easiest to implement accessibility features for. As you can imagine, it’s much harder to cater for hearing, vision, or mental impairments when it comes to housing. It’s also not that difficult or expensive to make your park more accessible. Wheelchair ramps: Unfortunately, mobile homes have to rest a certain distance above ground level. Stairs are obviously a huge obstacle for those who are wheelchair bound but can also be difficult to climb with other lower body disabilities. Make sure that you have ramps leading up to the homes. Handrails: All stairs and ramps should have proper and secure handrails. Grab bars: These are especially important in the bathroom where people need to move in and out of slippery fixtures like the shower, toilet, or bathtub. Toilet risers are also a handy feature. Wide doorways: Narrow doorways can be an obstacle to wheelchairs so make sure your doorways are at least the recommended 32 inches. And check to make sure there is enough space to turn around or even turn into various rooms. Showers: Showers shouldn’t have a high barrier, there should be seating, and they should have a movable shower head. Height: Usually, the higher something is, the harder it is to reach. For this reason, you should always make sure that any buttons, door knobs, working areas, etc. are accessible for those in wheelchairs. Flooring: Thick carpets are difficult to maneuver for anyone with any kind of disability, but too slippery floors aren’t advisable either. Wood flooring is usually a good option. You can also make life easier for those with vision impairments by installing tactile paving on your sidewalks. You should also include braille on any important signs or notices. Vocational events or workshops: Some veterans have skills they can use to start earning a living but don’t know where to start applying for jobs or further their education. Vocational workshops can be a great way to provide some guidance on how they can further themselves. Skills training or workshops: Some veterans struggle to become self-sufficient because they never learned an applicable trade except for being in the military. These workshops usually focus on artisanal skills that can be learned quickly and that have universal demand, such as plumbing, electrical work, etc. Financial management: Many veterans don’t know how to plan their future financially. They need help to learn how to do their taxes and use the capital they have to build a secure future. Community engagement: A little appreciation can go a long way. Many areas simply host events where members, and the outlying community, can come and show their local veterans appreciation with a meet and greet. Some events may include handing over small gifts in the form of treats or handmade cards. Community service: It might seem cliché, but sometimes the last thing people want is to be endlessly coddled. Veterans also want to show that they can be valued and productive members of the community. Organizing your veteran tenants into a group that regularly cleans the neighborhood or does outreach is another great way to build bridges and make them feel appreciated. Local veterans organizations may be able to provide more ideas for events and can even organize some of them on your behalf. Remember that veterans like to have fun too! We often forget that even people struggling under tough circumstances or from the residual effects of having served as veterans are still just people like you and me deep down inside. It doesn’t matter whether your park caters for veterans who have coped and are doing well or for those who are down on their luck, recreational amenities is still a great asset to have. Some amenities could have more utility for veterans than just entertainment. For example, a fitness center can also be a rehabilitation center with minimal modifications and some extra equipment. A swimming pool is another fantastic amenity for those who have physical problems. Swimming provides a no-impact way to exercise and water therapy is a highly effective tool to restore physical abilities. Another popular amenity for veteran communities is fishing. Although this can be harder to provide, especially depending on your location, it’s a very popular past-time among the older generation. It’s also a very relaxing sport/hobby that can be practiced by those who physically aren’t capable of taking part in sports. On top of the events and workshops aimed at helping veterans, you should also host social events on a regular basis purely for the fun of it. This is a great way to build a sense of community. By inviting outsiders, you can create a bridge between your park residents and the wider community. For a better understanding of your options, check out this list of extra amenities with their pros and cons that you can offer to make your mobile home park a better (and more fun) place to live. 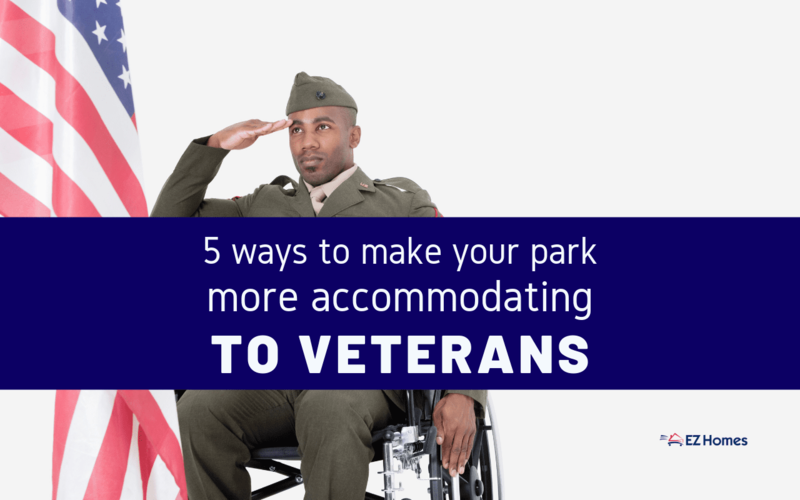 So there you have five ways to ensure that your park is accommodating towards our treasured veterans. As you can see, many of these you would have done for anyone, not just your veterans. These special measures also seem like a small price to pay considering the immense gratitude we owe to those who served our nation. Even if you can’t implement these changes before the 11th of November, why not just host a friendly communal cookout in honor of your veteran tenants? You would be surprised at how far even this small gesture of appreciation can go. Communities for veterans are just one of the directions in which a mobile home park can go. Today, there are many different types of mobile home parks or communities that we recently discussed in this article.